Alison Oman came to Idaho in 1984 with a college background in photography and printmaking, and a love of creating stories in pictures. She joined the Palouse Hills Weavers Guild where she learned to create her ‘pictures’ in tapestry. 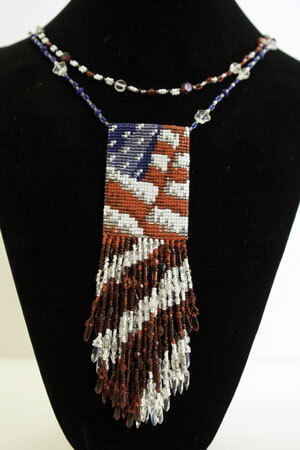 In 1987 a chance course in beading on a loom became the focus of her work. 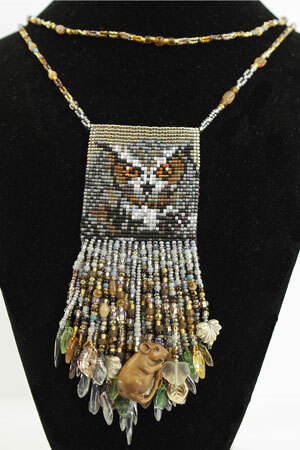 For the past 25 years weaving with beads of all types and textures – glass, ceramic, and metal – has been Alison’s passion. She is fascinated by the physical process of loom weaving to create “stories” of wearable art that can be worn as jewelry, or accessories, or incorporated into articles of clothing. Every piece is an original expression of her life’s journey. She likes to express everyday experiences like places she’s visited, paintings she’s admired and animals she’s loved, and also likes to portray the unexpected. 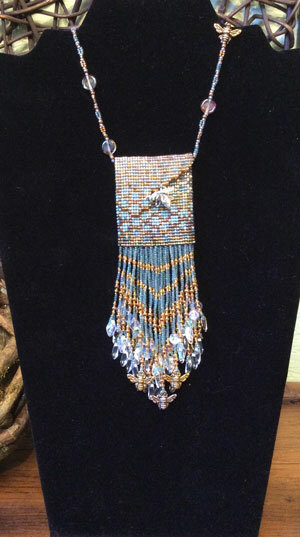 You can also see more about Alison and her work at the Dahmen Barn.